The High Tech Lock Pros in Washington DC and Maryland! 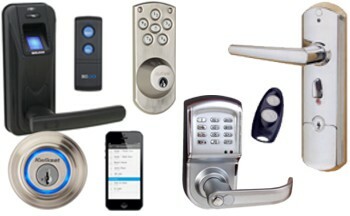 Thinking about upgrading to high tech locks for your home or business in MD or DC? Nobody installs, repairs, or replaces your high tech locks like the pros at King Door and Lock Maryland and DC. Our team of technicians is highly trained to handle your most sophisticated door lock needs, whether they be for home or business. We have the high tech tools and equipment to install and repair your high tech locks. With our up front pricing, you will not have any unpleasant surprises on your bill when the work is done. You may have sophisticated security needs and concerns and standard locks that use a key may not be sufficient. Whenever a key is even temporarily lent out to someone, there is the concern that it may not be retrieved, or even worse, that it may have been copied before being returned. In this event you may be ripe for a future security breach that you are not aware is coming. These situations are where electronic locks show their advantages. At King Door and Lock Maryland and DC, our technicians will install electronic locks of any type in your home or business. You may desire biometric locks where only people who can present a pre-approved fingerprint scan can gain entry to a room or building. New smartphone-controlled locks are becoming increasingly popular. With both biometric and smartphone locks, you do not need to worry about lending key copies that may, themselves, be copied without your knowledge. With a smartphone controlled lock, you simply share a code to authorize someone to enter your home or business for a specified period of time. During this time, they can use their smartphone to enter any room, building, or home equipped with one of these locks that you specifically authorize them to enter. Once the code you give them expires, they can’t get in anymore. You were able to give them access to your property during the time you needed their services with no lent keys and future security liability. We also excel in keypad lock installation and repair in MD and DC. Once you have your key code memorized, you never have to worry about a lost key preventing you from getting inside. Our fast and friendly 24/7 door lock services will handle all of your commercial and residential locks services. Our professional, dependable technicians will let you know the best solution to handle whatever you need with regard to high tech locks’ repair, replacement, and installation. They will provide you with up front pricing and competitive rates so you will know what you’ll be paying for the work and that you’ll be paying a good price for a professional job. Be sure to call King Door and Lock Maryland and DC to install and repair your high tech locks. We install commercial locks and residential locks. We can install locks that range from the simplest common key turn variety up to the most sophisticated electronic locks. Our 24/7 door lock services are here to serve you and we are only a phone call and free estimate away. High Tech Locks https://kingdoorandlock.com/high-tech-locks/ 3.9/5 based upon 15 reviews.